Stu Brew is to celebrate three years of Europe’s first student-run microbrewery by throwing open their doors and welcoming people in for a birthday bash. 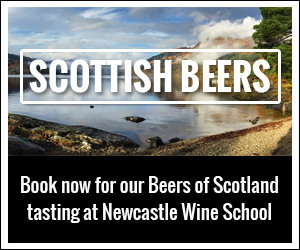 The Newcastle University based beer making enterprise installed its 2.5 barrel brew kit in autumn 2014. And current Stu Brew co-presidents Emily Warner and Daniel March said they are looking forward to showing beer fans what they do. “Being one of this year’s presidents for Stu Brew has already been an amazingly rewarding experience,” said Emily. “We’ve had a really successful summer and brewed two new beers for Fresher’s week and have now grown our own hops which are going into our latest beer. Daniel said: “This is an experience unlike any other and we can’t wait to see what the future holds for Stu Brew. Stu Brew was founded in August 2013, when it was one of only 25 environmental and sustainability initiatives in the UK to be awarded funding from the National Union of Students’ Student Green Fund. Its 2.5 barrel brewery was installed in 2014 and its first beer brewed in the November of that year. That feeling was echoed by fellow former Stu Brew president Sophie Murta. “Stu Brew has been a really rewarding project,” said Sophie, who was president for the 2016/17 academic year. “It’s particularly humbling seeing people enjoying a product you’ve had a hand in making. All of Stu Brew’s profits are invested back into training and development for students and to try and ensure the long-term sustainability of the enterprise. And sustainability is something the students seem to have taken to heart – Hops are grown on student allotments and the brewery uses a hot water recovery system to make the process more energy efficient. Spent malt is sent to a local farmer for use as animal feed and hop residue gets composted back on the allotments. Stu Brew has established a partnership with Newcastle University’s School of Engineering and act as a research unit for sustainable brewery design – with MSc and MEng research projects including a study into whether dried spent yeast could be used as animal feed and whether spent grain could be used to make biomethane fuel. 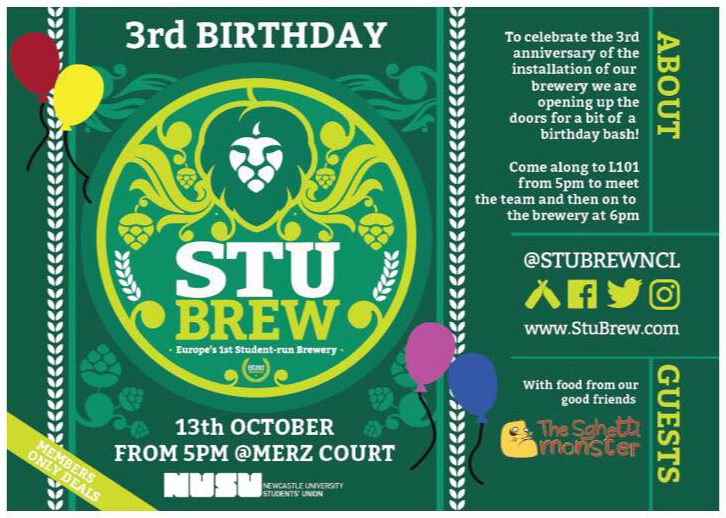 Stu Brew’s third birthday bash kicks off at 5pm on Friday October 13 with a brief presentation in room L101 of the university’s Merz Court on how students can get involved with Stu Brew and the society’s aims for the coming year. The party will then move to the brewery – in the car park behind Merz Court – around 5.45pm where a bar will be set up offering eight Stu Brew beers, food will be available from street food truck Sghetti Monster, and student radio’s DJ La Do will be providing the music.